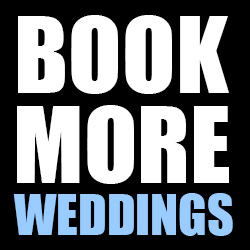 Subscribe today and get FREE ACCESS to my Book More Weddings Help Desk. When you have questions and need expert advice, help is only a click away! Each newsletter has a one-click no-hassle immediate unsubscribe option if you want to unsubscribe. No subscriber information is ever exchanged, sold, or otherwise distributed. ** Current subscribers please use this form to confirm your existing subscription.